Friday, March 29, 2019 – Sunday, September 30, 2019. Lewis Ginter Botanical Garden invites guests of all ages to come outside and play! The Art of Play transforms the Garden into a vibrant canvas where visitors can express themselves in a palette of playful activities. Interactive sculpture, innovative programming, multisensory activities and Pop-up Play Stations, all curated to engage imaginations and inspire flights of fancy, awaken the artist in everyone. 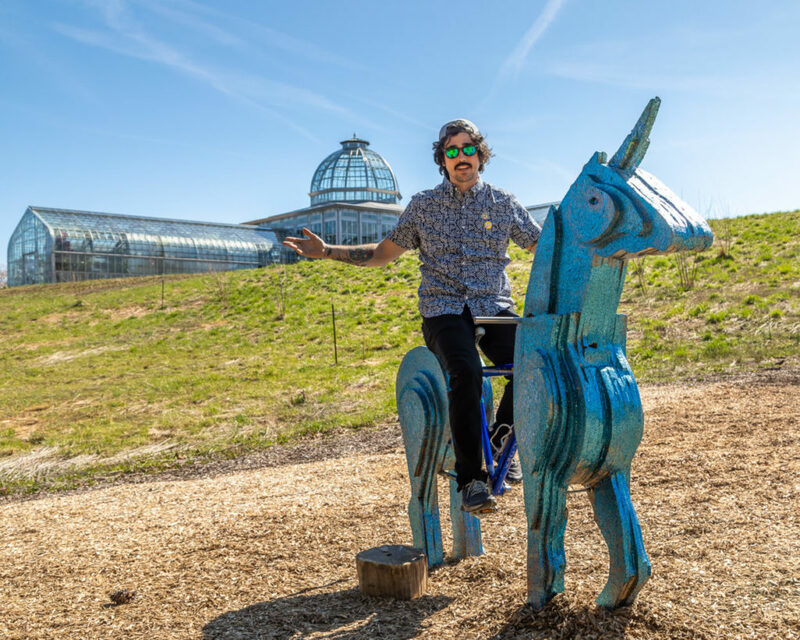 Six Virginia artists have created whimsical installations inviting adults and children alike to engage in the creative process — and experience nature anew. Sit astride a life-size wooden horse, play on a space-age seesaw, look through the lens of a giant kaleidoscope or make a giant impression on a pin-toy. This is art that’s meant to be played with! Nature Connects®: Art with LEGO® Bricks runs concurrently with this exhibition from June 28, 2019 – September 22, 2019. June 28, 2019 – September 22, 2019. Daily 9 a.m. to 5 p.m.; Exhibit and related activities are included with regular garden admission. The wildly popular Nature Connects®: Art with LEGO® Bricks by the award-winning exhibit by New York artist Sean Kenney will feature 24 sculptures in 13 displays throughout the Garden. Created with half-a-million LEGO bricks, many of the sculptures are larger-than-life and highlight the interconnectivity of all living things. For example, an oversized hummingbird and flower demonstrate concepts of co-evolution. A centerpiece sculpture of a Monarch butterfly, built from 37,000 LEGO pieces, draws attention to protecting the habitat of this beloved insect. There’s even a chance for guests to be part of the exhibit with a photo opportunity built into a mosaic of a garden scene. Experience the wonderful world of Butterflies LIVE! Tropical beauties — fascinating and showy — transform the Conservatory’s North Wing into a wonderland of vibrant colors, captivating sights and extraordinary discoveries. Butterflies LIVE! is an indoor exhibit filled with fun family activities for all ages. Get up close and personal as hundreds of tropical butterflies feed, flutter and take flight all around you. Explore their origins, preferred habitats and lifecycles. Photos are permitted, but we ask those taking photos to be respectful of other guests. Dominion Energy GardenFest of Lights is a holiday tradition featuring more than half-a-million twinkling lights, hand-crafted botanical decorations, model trains, holiday dinners, firepit with s’mores and hot chocolate (for purchase); nightly family activities & more. The region’s ultimate holiday extravaganza! Special events include Illumination Night, GardenFest for Fidos, Merry Mondays. Caroling Tuesdays, Artful Wednesdays, Musical Thursdays, New Year’s Eve Family Frolic and more. Membership allows you unlimited regular daily admission & much more!